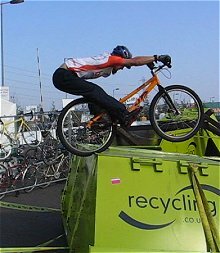 An amazing technique, for very high or vertical stuff if you can't land directly your bash guard or pedals in place. Not for the faint hearted forks (some would snap during the most critical phase). 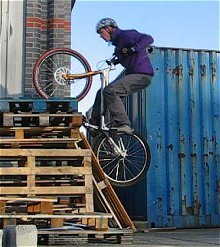 First you should know how to bunny hop or pedal up properly. 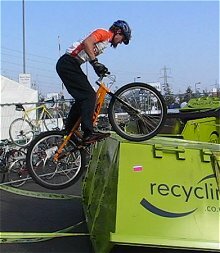 1° Slam the bunny hop into the obstacle, with the front wheel clear above the upper edge. 2° front brake full on, keep your whole body moving forward. 3° As the shoulders move beyond the bars, start to push up on your arms. 4° After pushing up, let your forward movement inertia bring you further over the bars and unlock the front wheel. 5° Complete the linear motion by extending the arms and let the front wheel lose again to roll forward. 6° Pull up the bike further by lifting the arms in front of you, for a nice finish on the rear wheel (fully extended). 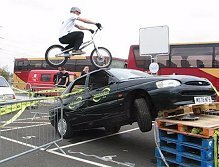 1° Slam the bunny hop into that wall, with the front wheel clearing the edge. 2° As the shoulders move beyond the bars, start to push up on your arms. 3° Complete the linear motion by extending the arms and let the front wheel roll forward. 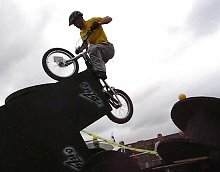 If you practice on something that is not too high, the first part of the move is quite easy, like a lazy bunny hop that does not even bring your crank up to the edge. But then the second part is truly spectacular. 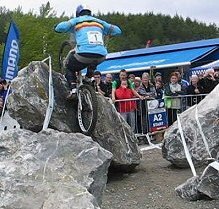 You must carry-on with the initial momentum to bring your shoulders beyond the edge of the wall, over the bars. The key thing is to have enough speed to build momentum and to keep your shoulders moving forward over the edge, so that you end up rolling on the front wheel while letting the rear wheel bounce up 90 degrees to follow in some sort of wheelswap. The push-up phase helps you to bring your whole body moving up again (a bit like in a static hop but assisted by the speed and the bouncing effect of the rear tyre on the wall). To understand the move, it really helps to practise on sloping walls, before attacking vertical stuff. Michele over a big kerb. 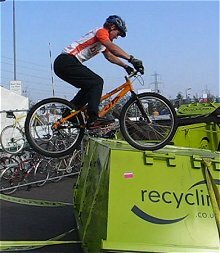 When attacking vertical walls, the strain on the fork is enormous, and some forks will just snap after too many sessions, typically on duty, with a nice potential for nasty crashes. (but hey...it's a top move). 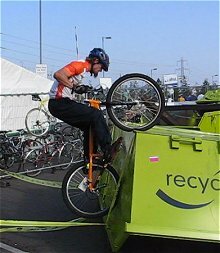 At the beginning, it's quite common to fall back, as you'll end up so much on the rear of your bike, with no proper support for the rear wheel. 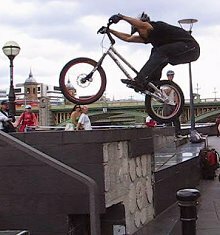 The trick is to avoid a full rigid stop when slamming the wall (a natural reflex). Instead, progressively absorb the horizontal deceleration without pushing back from the wall (that would break your forward momentum). As long as you are in that deceleration phase, you can still expect a decent grip from your tyres. 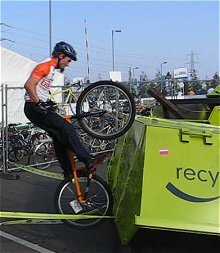 Experienced riders will hook their front wheel on about anything. The pressure in the bars is really high, as when you hang to the front wheel, it tends to turn and go flat on the side of the fork. 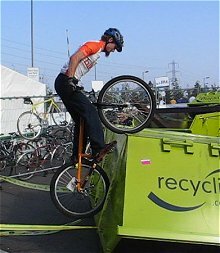 Being able to maintain the hooked position and hop directly to back-wheel is the most difficult part, since there is no momentum to smooth out the move. 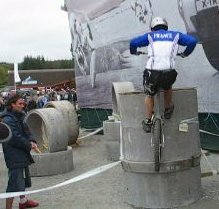 Gilles hooks a vertical concrete pipe. 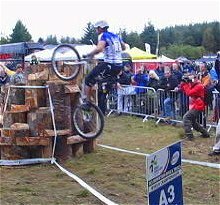 Vincent over the wood logs section.